My husband loves his pocket watches. He has three: one his parents gave him when he graduated college, one he bought himself and the one I gave him when we got married. So, tonight I had an extra good time creating my monthly Tim Holtz Tag as it featured such a watch. Tim used his large die, but I had his mini die and so I decided to give it a go using that one. For this tag, I used only Tim Holtz and/or Ranger products. That is not always the case, but this time I was able to find all I needed in my stash. Lots of stains, inks and embossing were used on this tag. I got to use a sentiment from a new stamp set by Tim on this tag. I don't know many people who strive to be ordinary, why not try to be unique! If you haven't tried making a tag of your own, I would suggest you visit Tim's blog and he will show you how to make one, and give it your own spin! Looking forward to seeing what the February tag will be and what new things I can learn and share. Your tag is gorgeous... so rustic! Love it! Your tag is fabulous. 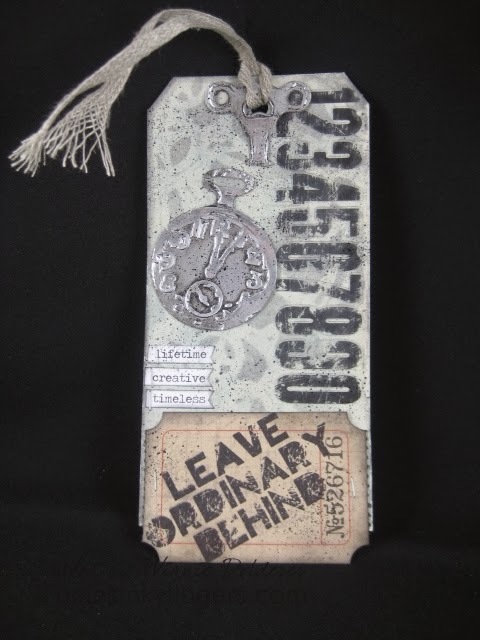 I really love Tim Holtz and all his fun creative products. Welcome to Tea Time Tuesday!